Scientists working in a range of disciplines joined forces to identify a new approach to combat African sleeping sickness. Fundamental research undertaken under the supervision of Professor Ute Hellmich of Johannes Gutenberg University Mainz (JGU) has revealed a promising strategy to develop a suitable agent. "There is still a long way to go before we arrive at a pharmaceutical product," said Hellmich. "But our highly interdisciplinary work involving parasitology, theoretical and organic chemistry, structural biology, and biochemistry has shown how the parasite that causes sleeping sickness can be rendered harmless." The researchers succeeded in demonstrating how a specific inhibitory substance docks on to and deactivates a vital protein of the parasite. African sleeping sickness is caused by trypanosomes, unicellular protozoans transmitted by the bite of an infected tsetse fly. According to the World Health Organization, the number of infected people has declined in recent years, down to an estimated 15,000 in 2014. However, establishing the actual incidence of the disease is difficult, as the early symptoms are similar to those of malaria. "Not only the poorest people in sub-Saharan Africa are threatened, but also their cattle, which are affected on a dramatic scale by certain species of Trypanosoma brucei," explained biochemist Professor Ute Hellmich. Currently, only a handful of drugs to treat sleeping sickness, which is fatal if left untreated, are available and these treatments are often accompanied by severe side effects and even fatalities in up to 10 percent of patients. Although new drugs are currently being developed, the approach of Hellmich's group goes one step further: "Our inhibitor opens up the future prospect of being able to design inhibitors on a fundamental level and could thus possibly also be used in the treatment of infection with other, related pathogenic parasites, such as Leishmania," Annika Wagner, lead author of the study recently published in Angewandte Chemie International Edition, pointed out. The principle is based on the fact that a small, selective inhibitor binds to the enzyme tryparedoxin. This protein is essential for the parasite, protecting it from oxidative damage, but is not present in humans, making it a viable drug target. To their surprise, the team of researchers discovered that when the inhibitor binds to the protein, two of the resulting inhibitor-protein complexes then combine to form a stable dimer. When this occurs, the usually monomeric protein ceases to function. "We were astonished and initially thought it was a chance effect due to experimental conditions," said Hellmich. The investigation was then extended, and it was verified in a large-scale study using various methods that the dimerization effect could be reproduced. In addition to the Mainz research teams of Professor Ute Hellmich and Professor Till Opatz, researchers from the universities of Frankfurt, Würzburg, Heidelberg, and the European Molecular Biology Laboratory (EMBL) in Grenoble were involved. The dimerization that the research has uncovered is unusual because the molecule responsible is extremely small. Most molecules that act like a molecular adhesive to combine individual monomers to form a dimer are relatively large. "Our molecule is much smaller and able to directly recognize the protein," explained Hellmich. Small molecules are also easier to smuggle into cells, which might be the starting point for new drug concepts. By precisely demonstrating the mechanism by which the parasite protein is chemically inhibited and dimerized by the small molecule, the interdisciplinary research partnership has staked out the fundamentals underlying such a new concept. "It was crucial that we didn't stop at our original goal of merely determining the crystal structure of the protein-inhibitor complex," said Hellmich. "Instead, we took a second look at the result and then discussed it with experts from different fields. Research only progresses when we work together." 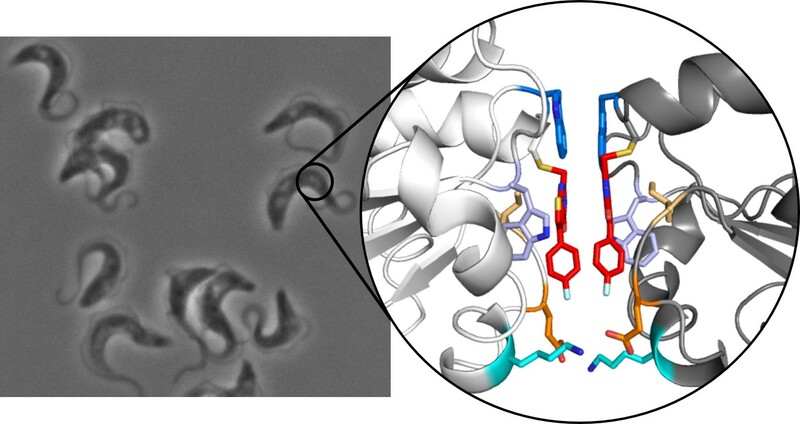 Trypanosomes, which cause African sleeping sickness, under the microscope (left) and the crystal structure of the tryparedoxin dimer (right): The two inhibitor molecules are highlighted in red.